Not to be confused with Pak Nam-chol (footballer, born 1988). 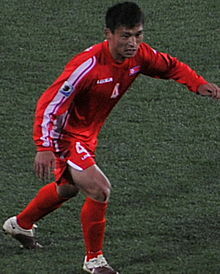 Pak Nam-chol (Chosŏn'gŭl: 박남철; Hancha: 朴男哲; born July 2, 1985) is a North Korean international footballer. Pak has appeared for North Korea in various FIFA World Cup qualifying matches since 2006, scoring three goals. He was also in the North Korea squad that qualified and played at the 2010 FIFA World Cup. Pak is described as the best North Korean player at the moment, and is the most capped player of the national team with 74 appearances. Scores and results list North Korea's goal tally first. This biographical article related to North Korean association football is a stub. You can help Wikipedia by expanding it. This page was last edited on 15 March 2018, at 15:19 (UTC).